The Maratha Vidya Prasarak Samaj is one of the most prestigious centers of learning in the State of Maharashtra. It has been over 105 years that it has stood the test of time to become legend of unparalleled stature. 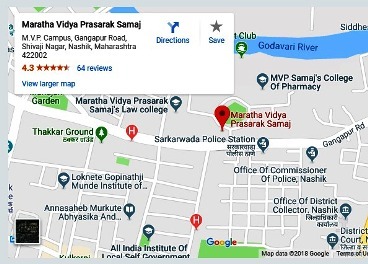 History says that the credit for the birth of M.V.P.Samaj goes to the young, enthusiastic and devoted team of social workers and educationists who were inspired by the lives of Mahatma Jyotiba Phule, Savitribai Phule and Rajashri Shahu Maharaj of Kolhapur. These young leading lights include Karmaveer Raosaheb Thorat, Bhausaheb Hire, Kakasaheb Wagh, Annasaheb Murkute, Ganpat Dada More, D. R. Bhonsale, Kirtiwanrao Nimbalkar and Vithoba Patil Khandalaskar, who laid the foundation of the Samaj. They were the men who envisioned a culture and knowledge centric society. The motto of the Samaj reads for the well being and happiness of the masses to kindle the social cause.